Newsr gives you a tablet-centric way to casually read your Google Reader RSS feeds. 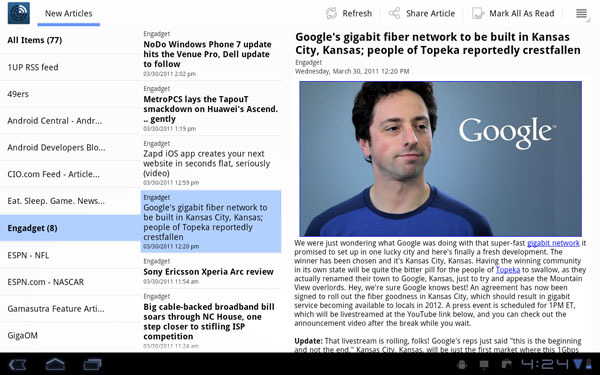 Newsr takes advantage of the screen real estate on your Xoom device and gives you an elegant way to read your news. Newsr stays in sync with your Google Reader account so you'll never read the same news twice! I built Newsr and have updated it to add a host of new features and an improved user experience. The Market site hasn't updated with the new screenshots yet, so I'll include those here as well. Last edited by Chris Stewart; 06-03-2011 at 11:04 AM. SocialBlast (FREE -- Phone/Tablet) - Quickly and easily update your social networks. Friend Me (FREE -- Honeycomb Optimized) - A tablet-optimized experience for Facebook. TweetComb (FREE -- Honeycomb Optimized) - A Twitter client optimized for your Honeycomb tablet. 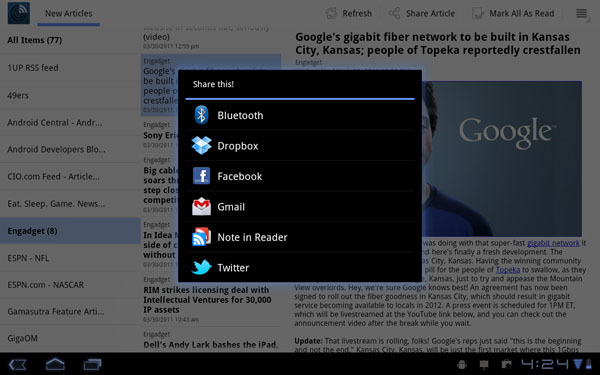 Newsr (FREE -- Honeycomb Optimized) - A Google Reader client optimized for your Honeycomb tablet. - Let user do landscape with either side being “up”. - Preference for hiding labels/feeds that are empty. - Improved the performance of the “Mark all as Read” option. - Removed feedback link in preferences so I can submit to Amazon. I'm very proud to announce Locomo Labs! Locomo Labs is my new company where all of my existing apps will be actively developed, along with the creation of new apps to be made available in the coming weeks and months. Locomo Labs has been in the works for a few months now and we're finally ready to share it. This opportunity will give me the much needed flexibility to work on my apps in a full time capacity -- which means better quality, more frequent updates, new ideas, new apps, and more options for the Android community. I'm really excited to continue working on TweetComb, Newsr, Draft Manager, MFL Fantasy Football, and the unannounced projects currently under development. - Expanded label/feed view to show up to 3 lines for a title. - Expanded the “Starred” label to show up to 300 starred items. - Adjusted launcher icon from 72 x 72 to 65 x 65. - BUG: Removed HTML tags from article title. - BUG: Escape article source for both article fragment and article detail fragment. - BUG: Labels with spaces wouldn’t “mark all as read” when requested. - BUG: Stability around portrait mode has been greatly improved. - BUG: Fixed text scrolling issue present in Galaxy Tab 10.1 running Android 3.1. Cool, I downloaded this yesterday when I saw it was yours. I'll have to go grab the update now. - Fixed the built-in web view from a scrolling issue. - Added a header to the web view, like TweetComb. - BUG: Made the starred download count a configurable property. Loading too many was causing force closes. - BUG: Account list was showing more than just Google accounts. This is really a great news reader. I really like the way it scrolls and how the photos are displayed at the right of the news stories. Very smooth running.